From March 25th to April 1st, Mr. Enrique Colmenárez will visit Dane County as part of the Dane-Andres Eloy Blanco sistering relationship. 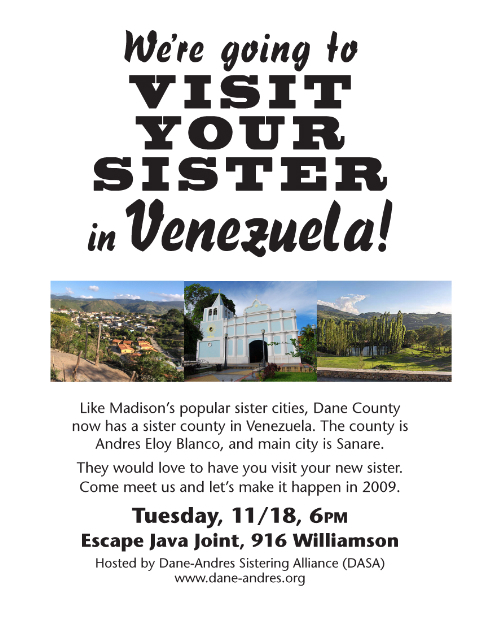 Working to build solidarity and understanding with the people of Venezuela, the Dane-Andres Eloy Blanco Sistering Alliance (DASA) will meet to plan the upcoming visit of a Venezuelan delegate to Dane County as well our summer delegation to Venezuela. Our regular meetings are on the first and third Tuesdays at 5pm at Michelangelo's, 114 State St. in Madison. The next meetings are 10/7 and 10/21, 11/4 and 11/18. The next DASA meeting is the 3d Tuesday, that being next TUesday, 9/16. place is Michelangelo's coffeeshop on State. DASA received a small shipment of coffee donated by the coffee cooperatives in the Andres Eloy Blanco region. Just Coffee has roasted it up for us. For more information or to order coffee, contact coffee@dane-andres.org. La Peña :Celebrating Latin American Culture! 5-8 pm at Centro Hispano 810 W. Badger Rd. Free! For the whole family.